The proverb "Black should resign if one player has four corners" is a combination of two proverbs: "If Black has all four corners, Black should resign" and "if White has all four corners, Black should resign". They are tongue-in-cheek statements based on the fact that normally White is a stronger player than Black. 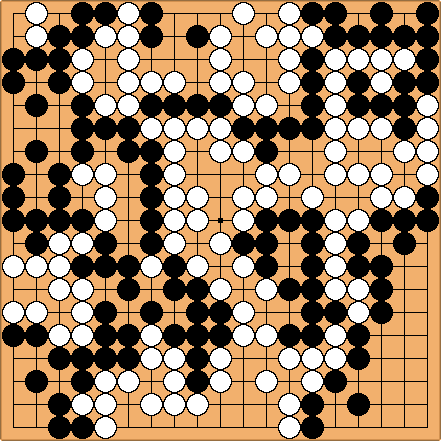 Therefore, if White has managed to capture all four corners, it is assumed that Black has lost the game. Conversely, if White has let Black take all four corners, White has taken so much profit elsewhere that Black should still resign. See also Proverbs Do Not Apply To White. This proverb seems to be the weakest one. Let's consider a 9 handicap stones game (or any >4 handicap stones game), the 4 corners are open. This proverb encourages beginners to protect their corners in handicap game even if it's a bad idea (because hoshi isn't conceived for territory). 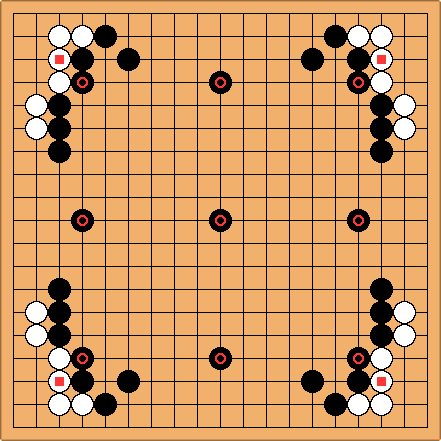 Should black REALLY resign in this position? Besides, if white player invades the 4 sansan, black might want to resign (because of the proverb) despite the fact that he's probably ahead, as shown on this diagram.Guillaume Chanson? se: I have to second kevinwm. What proverb is accurate every time? The point is that in most games, especially amateur games, most proverbs will hold, and are worth keeping in mind. This proverb reminds black not to overvalue the corners. I will point out WuRenGo2.